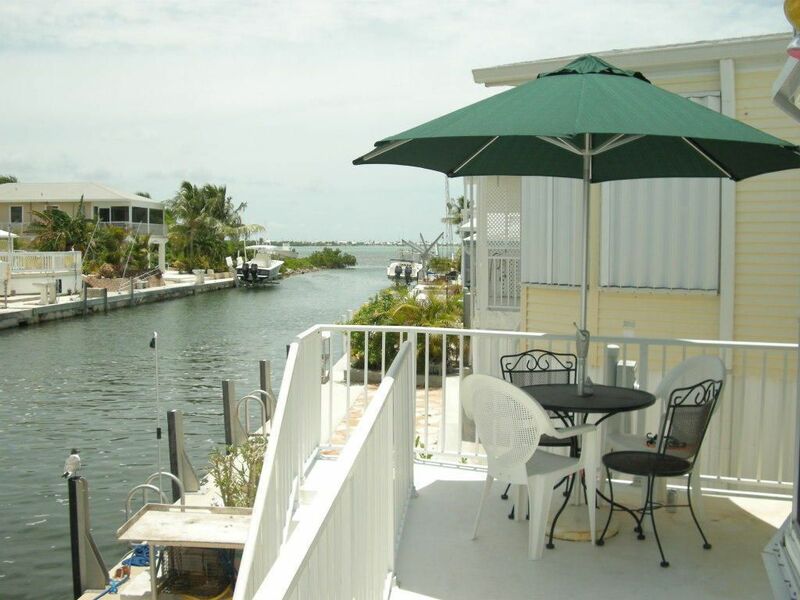 Venture Out - Waterfront Paradise 2/1, with 35' Dock and open water views! We love Venture Out and hope you'll experience the beautiful Florida Keys like a Floridian. Our little piece of paradise has so much to offer, whether your here for a weekend, a week or a month. The cottage and Venture Out has all the amenities you might find elsewhere, except its all contained in a safe and secure setting. Our home has 2 bedrooms and 1 bath, 1 queen bed and 2 singles along with a leather couch which opens to a full sleeper. The home sits on a 60' wide canal with direct access to open water. There are TV's and wifi available for you to enjoy, along with games and bicycles and kayaks to explore the compound and the local waters. Enjoy coffee on the 35' dock at sunrise, or Margaritas watching the sun go down. Bring your own boat or have one delivered to the dock. You can drop in a line right from the dock and catch dinner if you wish, or experience the many local restaurants specializing in local seafood, most will cook your catch. No fast food here! We have our own Marina and store, tennis court, basketball court, bocce ball, putting green, Olympic pool, kiddie pool, jacuzzi, playground and picnic area with Tiki hut. We even have our own post office for those that want to send postcards of their stay in the Keys! During the season enjoy pancake breakfasts-all you can eat, and Happy hour on Fridays too! Close by are many great places for snorkeling, diving, fishing including world famous Looe Key Reef. We have access to both The Atlantic Ocean and Gulf of Mexico for great fishing. Only miles to Bahia Honda State Park and Fort Zachary Taylor Park. Both of these attractions draw people from all over the world. Each has a wonderful concession stand which makes them great for an all day trip. Many restaurants, shopping and a variety of night life only 15 miles away at Key West. Experience Sunset at Mallory Square or have a beer at Sloppy Joes. Walk through Hemingways home or visit the treasures at Mel Fishers museum. All of these things are at your door and only minutes away. You can bring your boat, or rent from one of the local rental companies, some will deliver to our dock for you. No charge for putting your boat in at the Marina at Venture Out. (the park charges a daily fee for trailer and extra car parking) There is a resort charge when you check in, payable to the park, cash only. Enjoy your time at Venture Out, we are happy to host you for your stay in the Keys. We are long time Florida residents living in Miami, we have children and Grandchildren and enjoy all that Florida has to offer. We love to travel and love making new friends. When we decided to purchase a keys home to get away, we wanted a secure and friendly environment. One that offered an abundance of things to do, but mainly waterfront property. Venture Out has all of these and more. The location to pristine waters and parks, worlds finest fishing and diving as well as Key West and all it has to offer, and the comfort of a home, not just a bed. Blue ray with many DVD's obtained from various criminal elements, watch at your own risk! Also Netflix available. Both and upper deck with Umbrella and a dockside table with benches and umbrella. Swim ladder and fish cleaning table. We have3 kayaks for your use and 2 adult life jackets. Misc water sports gear, noodles Beach chair. We have a ramp up to the front door. It is visible from the roadside picture. Also with a kiddie pool! We truly enjoyed our stay! How can you not enjoy being in the sunny keys! Can’t wait to return!!! Great view of the ocean, and very homie. This place had everything we were looking for, pool, sauna, ocean swimming area, close to key west and very cute tiki restaurants near by. Met some really nice people who were also visiting. My only complaint, was the people who lived in the community, where not as friendly, and they don't know what a stop sign is.. Lol... But, it didn't ruin my time. Lovely house!! Everything ok.we like the house.This morning was havy rain and water was paddle by front door in the living room. We were there for a wedding in Key West and this place fit our needs perfectly and an easy drive to Key West...had a great time. We just returned from a 4 day stay at Venture Out in Cudjoe Key. This double wide mobile home fit the bill perfectly. It was clean and bright with more than enough room for us to enjoy our stay. The public pool was heated to a warm 86F degrees. Key West is a short 20 minute drive down highway one, so the location is great. We especially enjoyed lunch at The Square Grouper which is the number 1 restaurant in the keys and just around the corner. A little issue at the gate when we arrived was solved immediately by Jim. Pride in ownership is evident in this rental! Thanks so much! Very nice location and proximity to Key West! Quiet and relaxing! People are very friendly and approachable. Lots of amenities! So many things to do in the beautiful Florida Keys, rent a boat in Summerland, or rent one and have it delivered to our dock. Visit Marathon and the Turtle Hospital or Dolphin Research Center and swim with Dolphins. Learn to Kite Board, Paddle board, or dive at one of the great reefs like Looe Reef or Bahia Honda State park, or visit Ft. Zachary Taylor State Park in Key West. There you can rent jet skis or visit the museums and aquarium, or just do the Pub crawl. Ask and we can give you many referrals for a variety of things to do. There is a resort fee of $53.75 payable upon arrival at entrance to Venture Out. This is in addition to my rates. Lobster season and holidays require one week minimum stay. This is a non smoking residence. If you smoke outside please clean up your area. THIS IS STRICTLY ENFORCED.